The RSMediaGallery! 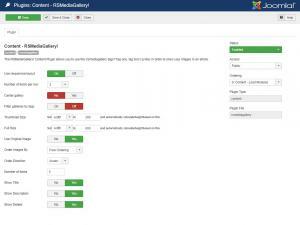 Content Plugin allows you to publish a gallery within standard, Joomla! articles. The plugin can be installed using the standard Joomla! installation procedure. Head to Extensions >> Extension Manager, browse the file and click on the Upload and Install button. 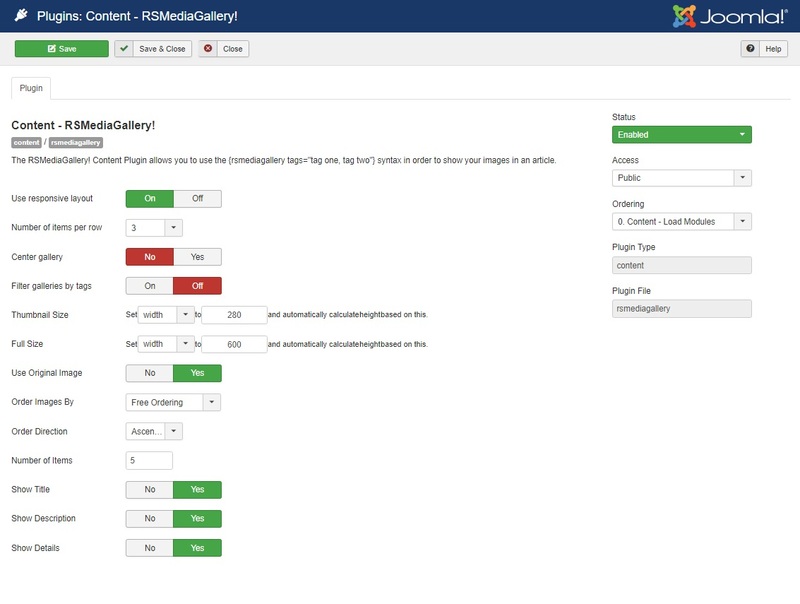 After the installation is complete, you can access it here: Extensions >> Plugin Manager >> Content - RSMediaGallery!. Along with ver. 1.9.0, the Content Plugin was adjusted so that it displays an overlay containing the image title and description when hovering the cursor over a thumbnail. Note: The following parameters are applied globally - the same settings will be used for all galleries that are published via the RSMediagallery! Content plugin. Use Original Image: Specify if the full image is shown instead of the full resolution crop. Thumbnail Size: Specify either the width or the height of the thumbnail images. Full Size: Specify either the width or the height of the full images. Order Images By: Free Ordering / Random / Title / Description / Hits / Created date / Modified. Order Direction: Ascending / Descending. Number of Items: This is the number of images that will be displayed. Use 0 to display all. Show Title: Yes / No. If set to yes, the image title will be displayed. Show Description: Yes / No. If set to yes, the image description will be displayed. Note: Only one of the width or height parameters is taken into consideration - the other will be ignored and calculated automatically. image: use the number of the image you would like to show up (eg. image="1" to show the first image from the set) and the others will be hidden but still visible in the lightbox when it opens up.